Carbon fiber has been confined, until recently, to military and aerospace applications – or at least to places where cost was no object. Manufacturing carbon fiber is now much less expensive, since large quantities can be produced, and a wide variety of industries now take advantage of its incredible properties. Proven over the last 20 years, carbon fiber is durable, incredibly strong and safe. It does not mildew or rust, nor is it subject to alkali deterioration. Plus, once we lock the carbon fiber into an epoxy matrix, its strength is sealed in – it won’t creep, stretch or bend over time. Fortress Stabilization is dedicated to developing products that take advantage of this material and its incredible characteristics while retaining a simple, reliable application method. NO destructive attachments made to the floor or ceiling. Non obtrusive-lays flat to substrate. Able to conform to bowed walls. Vacuum clamping system ensures regulated void-free bond every time. Mesh is fully encapsulated in epoxy, anchoring it in place. Can be painted for a smooth clean look. Clean-Peel backing strip provides clean prepared bonding surface. The Fortress Stabilization Systems is backed by the best warranty in the industry. In the event the stabilization repairs fails. We will pay 100% of the cost to have steel beams installed. 1. The wall is ground to prepare the surface for bonding. 2. Clean-Peel providing a clean textured wall for a superior bond. The fabric keeps the area uncontaminated until application of carbon fiber reinforcement. 3. Carbon reinforcement supports come complete with Clean-Peel backing. The backing provides a clean, textured bonding surface for a flawless epoxy bond. 4. Our Fortress system epoxy is applied to the wall using a static mixing tip to ensure a perfect mix ratio every time. 5. 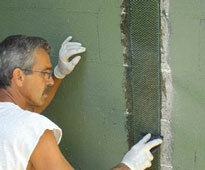 Epoxy penetrates the mesh fully encapsulating the carbon and eliminates air bubbles or resin voids. 6. Fortress system Vacuum clamping provides even pressure over the entire strip while the epoxy hardens to provide superior void free bonds. Frank's Basement Systems offers foundation services in East Amherst, Buffalo, Clarence, Tonawanda, Hamburg, Lancaster, Orchard Park, Depew, Grand Island, East Aurora, and surrounding Western New York areas.